INDYCAR has re-tweaked the qualifying format to fill the traditional 33-car starting field for the 98th running of the Indianapolis 500 via an addition to next month’s practice schedule at Indianapolis Motor Speedway. The schedule change features a Verizon IndyCar Series practice session on Monday, May 19, from 12-5 p.m. (EST). The extra day of on-track activity will be open to the public like any practice day during the Month of May. “The Greatest Spectacle in Racing” is scheduled for Sunday, May 25. In March, INDYCAR unveiled a qualification format featuring three sessions of time trials over two days, with the goal of increasing entertainment value, fan attendance and TV viewership over the May 17-18 weekend. 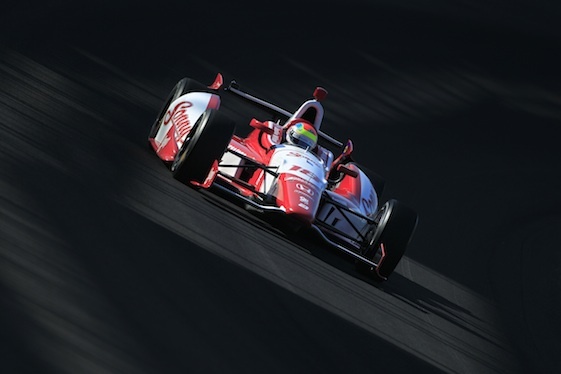 Time trials will culminate on Sunday, May 18, with the Fast Nine Shootout, which will determine the coveted Indianapolis 500 pole position and recipient of the Verizon P1 Award. INDYCAR also confirmed an update to the qualification format that allows a competitor that suffers a hardship in qualifying at the conclusion of Saturday, May 17, an opportunity to make the starting field during Sunday qualifications. This revision also would permit teams that want to bring new entries forward after qualifying on Saturday an opportunity to compete for a position in the race. In both cases, these teams would be restricted to the last row of the field. At the conclusion of Saturday’s qualifications, positions 31-33 will be provisional and those cars – plus any entry not already in the field that has declared its intention to qualify to INDYCAR prior to 7 p.m. (EST) on Saturday – will participate in a separate qualification session on Sunday to determine the 11th row on the grid. _ The fastest 33 cars will make up the starting field (but not starting positions). _ All entries are guaranteed at least one, four-lap attempt to qualify. _ The fastest nine entries advance to the Fast Nine Shootout. _ The Fast Nine Shootout (2:00-2:45 p.m. EST) _ Determines the Verizon P1 Award winner and first three rows of the race. The Fast Nine Shootout was introduced in 2010 as a part of time trials. Ed Carpenter claimed the pole last May with a four-lap/10-mile average speed of 228.762 mph, becoming the first team owner/driver since 1975 to earn P1. Eighteen drivers have won the historic race from the pole position, most recently Helio Castroneves of Team Penske in 2009. Rick Mears, who earned the pole six times at IMS, won three of his four races for Team Penske on the 2.5-mile oval from the top starting position. A four-time Indy 500 pole-sitter, Castroneves will attempt to join Mears, A.J. Foyt Jr. and Al Unser as the race’s only four-time winners. Tony Kanaan, who won the 97th Indianapolis 500 after starting 12th for KV Racing Technology last May, will attempt to defend his title next month with Target Chip Ganassi Racing. Mears (1979, 1981) and Johnny Rutherford (1980) combined for the lone three-year stretches during which the pole-sitter won the race. Fans can follow qualifying for domestic open-wheel racing’s premier event via ABC’s extensive coverage. The network will televise qualifications live from 4-6 p.m. (EST) Saturday, May 17, and 1-3 p.m. Sunday, May 18, in addition to the race, marking its 50th consecutive year of coverage. Additional hours of qualifying will be carried on ESPN3, ESPN’s multi-screen live sports network, with the full schedule to be announced at a later date.